Barclays bank on Lincoln’s High Street celebrated on Friday its relaunch with a ribbon cutting event, after a dramatic makeover. The bank’s revamp, which took three months to complete, saw the old carpets replaced with tiles, new cashier desks and ATMs installed, and bigger windows installed for better lighting. To celebrate, under an arch of balloons over the new entrance, Lincoln MP Karl McCartney cut the ribbon, officially re-opening Barclays (pictured above). Meanwhile, staff handed out balloons to shoppers outside and those who entered the bank were offered free hot chocolate and face painting. Outside, a dancing string quartet performed various well-known musical pieces as the “Barclayguards” danced and entertained passersby. 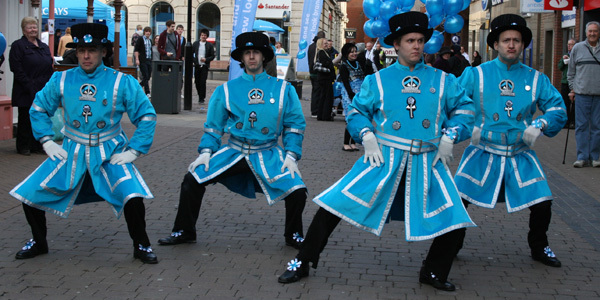 The Barclayguards dance in front of a large audience. At Cornhill, Lincolnites could have their picture taken with the authentic Barclays Premier League Cup and enjoy a shortbread biscuit. After the ribbon cutting, a street performer amazed crowds by juggling 18-inch knives over a spectator, then allowing the participant to stand on him. The performer was sandwiched between two beds of nails at the time, and managed to stay there for 18 seconds — a personal best. Nail sandwich: A member of the crowd stands on the performer. Andy Sumner, Head of Chief Distribution Office, opened the branch with Karl McCartney. McCartney said: “I am delighted that all customers now have easier access to banking services in Lincoln. The new facilities will provide the latest technology for customers and the new design of the branch ensures customers have improved areas in which to do their banking. To see our full gallery of the day, visit our Facebook Page.